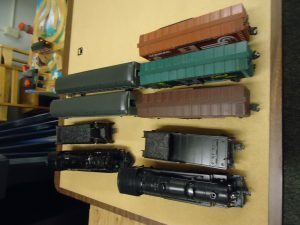 Prep work has begun at the museum to allow Mr. Pagano to start working his magic on our Lionel Layout exhibit. That means cleaning everything out from under the layout and starting to remove items from the layout. This is the boring part. It also means creating adequate work space. All parts and pieces, cars and buildings get laid out on tables. Here are some photos of the progress. Since it’s founding by Joshua Lionel Cowen in 1900, Lionel Manufacturing Company near City Hall in New York City has been delighting train lovers around the world. 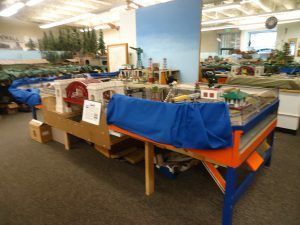 We hope we at the Bellingham Railway Museum can delight you with our new Lionel exhibit when it is completed. This entry was posted in Uncategorized on July 9, 2016 by Shelissa Griffin.